At the time when Caravaggio created this picture, the patronage of rich gentlemen was very popular. It was created as a competitive basis for Cardinal Francesco Bourbon, who was engaged in particular in that he patronized young and talented artists. This picture was supposed to show the earthly and rather sinful Amur as opposed to the heavenly and pure Amur. That is, this should have been not only dark wings, but also the appropriate form. His posture and actions should also speak about whether he won in opposition or lost. And Caravaggio did it perfectly. The painting depicts a recalcitrant boy, who either sits or slides off the dais at this moment. And around him scattered various objects. But what he looks like! He looks straight at the viewer with shameless eyes, and his whole posture speaks of his rebelliousness and bold nature. 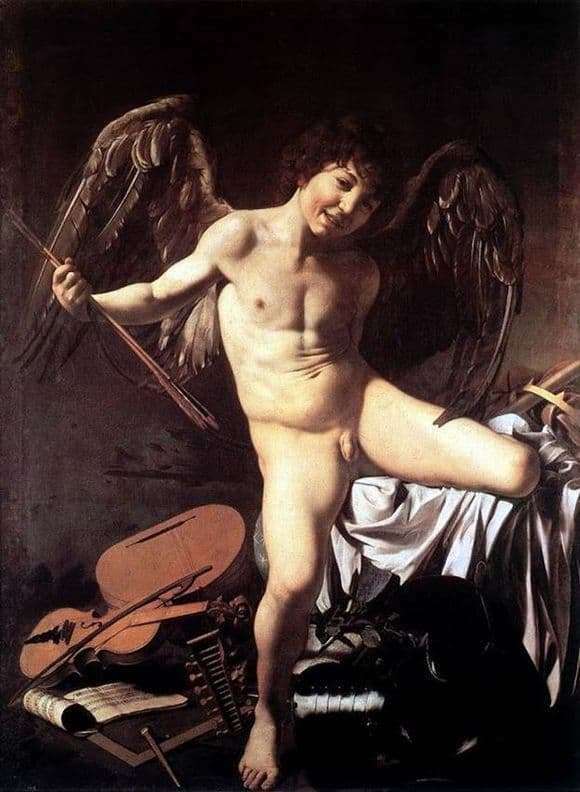 He holds arrows in his right hand that can pierce any heart and make him submit to love, and his sly smile hints that he likes to joke. He has black wings behind his back, and it is difficult to understand whether they are dirty or just worn. Junk from different spheres of human life is scattered around Amur: this is the musical sphere, expressed in lute, notes and violin, and power and military prowess, expressed in crown, baton and armor. Naked Cupid does not pay any attention to what is happening around him. Chaos reigns in the room, it creates the feeling that they have only recently fought here. But who and why – to explore and understand the viewer on their own.